On Dec 7, 1941 the United States was catapulted into the escalating war with the Axis Powers of Germany, Italy and Japan. The event that changed what had been previously viewed by Americans as a European War and not worthy of changing the national non-interventionist status was the bombing of Pearl Harbor by the Japanese. Prior to that the Franklin Delano Roosevelt presidency had done everything in it's power short of actually declaring war to help the Allied Powers in their ongoing struggle, including the Lend-Lease program, which basically gave aid without actually deploying soldiers to help. Pearl Harbor changed all that. The U.S. declared war in retaliation and the war was on for the US, both on European and Asian soil as well as on the home front. Frank Capra joined the fight 4 days later, becoming a major in the United States Army. At age 44, he was a little too old to be fighting, but he became a prolific help in the battle on the home front. His major role in said effort was to film a seven part series of films, a sort of counter-effort to the propaganda films that Nazi Germany and the Japanese were creating for their own efforts. 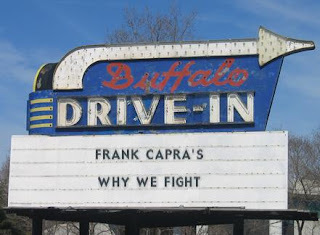 Primarily Capra wanted to counteract the Nazi/Leni Riefenstahl propaganda film Triumph of the Will. 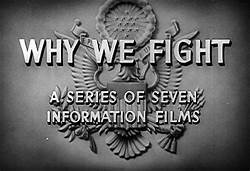 The Why We Fight films were initially made to educate members of the Armed Forces for the need to fight the "good fight". Ultimately the first film focuses mainly on Italian and Japanese aggression, reserving the bulk of Nazi Germany's role in the war for the next film. The Nazis Strike: The second film in the series and delves into the duplicitous nature of Adolph Hitler, as well as his and Nazi Germany's use of fifth columnists (Traitors inside the countries he sought to conquer. It reveals the many treaties of non-aggression that Hitler signed with various nations only to tear up those treaties and invade anyway when the time was ripe. There are some inaccuracies within the film, primarily concerning the Soviet and German relations within Poland. This was primarily because, at the time, the Soviets were allies in the struggle and it was probably a good idea not to make an enemy of a "friend", but to some historians it does have some inconsistencies. Divide and Conquer: Continuing after the fall of Poland from the second film, we are continuing to see that any pact or statement made by Hitler is only just so much bull as he invades other countries with whom he had agreed to leave alone. This hearkens back to the Heartland Theory, covered in the second film, which basically reveals that the ultimate goal of the Nazis was to conquer the entire world. As Hitler continues his drive to be a world dictator, he invades the northern countries of Denmark, Norway, the Netherlands and Belgium. France is next. The Battle of Britain: After the fall of France, Britain is left almost solely to fight the war herself. An early effort by the Nazis to take out military installations and ports is resisted wholeheartedly, so Hitler tries a different tactic; attacking civilians, bombing the city of London. But this blitzkrieg is also resisted by the determination of the British citizenry. As Churchill says "never[...] has so much been owed by so many to so few". The Battle of Russia: represents how hard the Soviet allies have struggled against invasion, not only against the current enemy of Germany, but down through history. Here again the Soviets are cast in a positive light as the good guys because of their association with the Allies, not mentioning certain factors that would have shed a negative light on them if they had been portrayed; such as the Soviet role in the invasion of it's neighbors prior to the conflict. The Battle of China: The series moves east and focuses on Japan's aggressive nature, specifically with it's attempts to conquer China. Japanese conquest of the Orient would pour into their factory the almost unlimited resources of that area, and of the peoples of the earth, a thousand million would come under their rule, slaves for their industrial machine. Altogether, the German, Italian and Japanese aggressors would undertake a catalystic crisis, one that would enslave most of the world's population and liquidate about 90% of cultural life on Earth. If you are as avid devotee of history as I am, I think you will find this series extremely riveting. Even if you only watch it to gain a perspective of the times, it will certainly open your mind. And you can watch Casablanca, the next time in a whole new light.